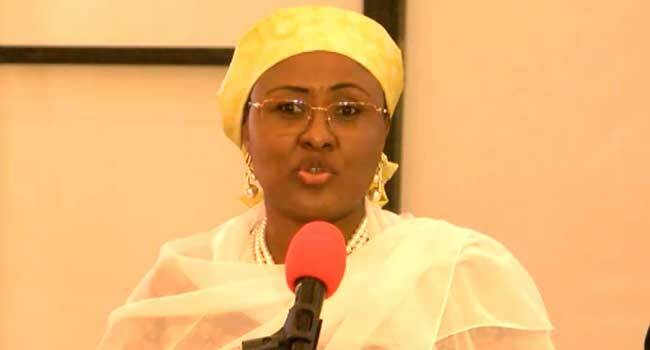 Wife of President Muhammadu Buhari, Aisha has explained why she criticised her husband’s government stating that she stands by the truth. In her acceptance letter on Saturday to Vanguard Newspaper which recognised her as Vanguard personality of the Year 2017, she said her 2016 interview which was considered as a critic of her husband’s administration was based on her sense of justice. She clarified that she was brought up to stand by the truth and this will always be her position adding that she did not intend to confront or disrespect the president. “I wish to thank the management of Vanguard Media Limited for this unexpected award, in recognition of my humanitarian efforts towards improving the health and welfare of Nigerians particularly women, children and less privileged. “I need to state that my position was a result of my sense of justice and not confrontation or disrespect. I was brought up to stand by the truth and this is how I have always been,” she said. Mrs Buhari explained further that Nigerians elected her husband as President based on their trust in him. “As we are all aware, Nigerians elected this administration based on the trust and confidence they have on my husband; I, therefore, feel that we are here to serve Nigeria to the best of our ability,” she added. She also pledged unflinching support to her husband’s administration. “Let me use this opportunity to state that I support my husband in this call to service and will continue to do so. Mrs Buhari had in the 2016 interview with BBC warned her husband that she might not back him at the 2019 election unless he shakes up his government which she claimed was veering from its mandate to the people. Also in January 2018, the President’s wife using her official Twitter handle @aishambuhari reposted videos of two senators criticising the Federal Government. Senator Isah Misau representing Bauchi Central at the National Assembly in the video criticised the appointment of the Director General of National Intelligence Agency (NIA) questioning if he is qualified for the position. “So many incompetent people are holding so many positions. Fifty percent of the ministers are not performing. Since the president assumed office he has not taken any decision to move this country. Today we are seeing it and everybody is avoiding it, nobody wants to say anything,” Misau said in the video.